The 6U Rack UPS unit (RT8kVA or RT11kVA) is shown in Figure 1. 6U Rack or Tower UPS units feature Advanced Battery Management (ABM) technology that uses a unique three-stage charging technique that significantly extends battery service life and optimizes recharge time, compared to traditional charging methods. 6U Rack or Tower UPS units come standard with the Maintenance Bypass module, which enhances system availability by providing service continuity during UPS maintenance and upgrades. 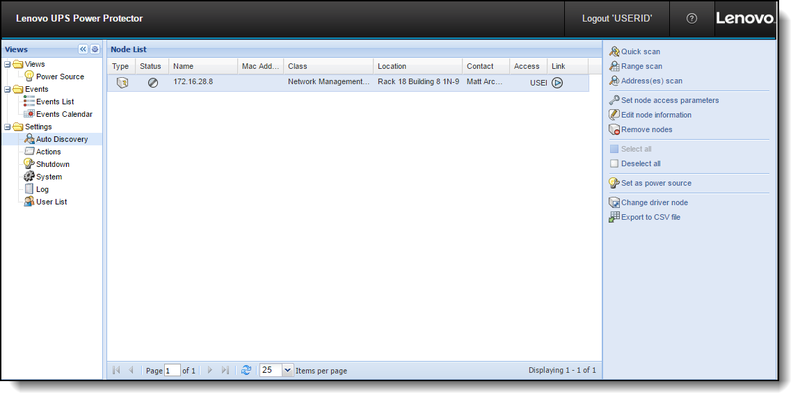 6U Rack or Tower UPS units come standard with UPS Manager software that integrates seamlessly with the major virtualization platforms, which enables you to view and manage your entire power system from your current dashboard. It also triggers live migration during power outages and avoids data loss by gracefully shutting down virtual machines and hosts in a cluster if there is an extended power outage. Table 1 shows the part numbers and feature codes for the 6U Rack or Tower UPS models and options. The RT8kVA and RT11kVA 6U Rack or Tower UPS units have a hardwired terminal block connector for AC input power. All 6U Rack or Tower UPS models come standard with a NMC installed. 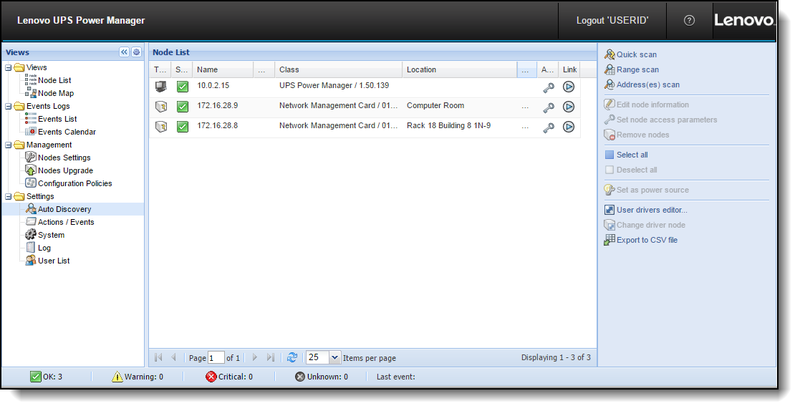 The NMC provides convenient, over-the-network UPS remote monitoring and management through a standard web browser or UPS Power Manager UPM software. Figure 2 shows the UPS NMC. An optional EMP (part number 46M4113) is used to report local temperature and humidity values and make that information available to management tools. The EMP connects to the UPS via the NMC. The EMP is shown in Figure 3. The RT8kVA and RT11kVA 6U Rack or Tower UPS units protect against the following power problems: power failures, power sags, power surges, under-voltage, electrical line noise, over-voltage, frequency variation, switching transients, and harmonic distortion. Table 2 lists the technical specifications for the 8kVA and 11kVA 6U Rack or Tower UPS models. Table 3 lists the expected period that the 6U Rack or Tower UPS models operates only on batteries, depending on the load. The 6U Rack or Tower UPS units have a 5-button graphical LCD on the front. 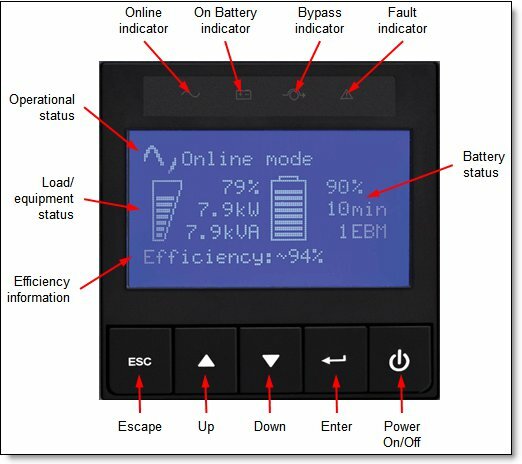 It provides useful information about the UPS itself, load status, events, measurements, and settings. Figure 4 shows the control panel on the front of the 6U Rack or Tower UPS. Measurements: Displays the output Watts/VA, amperage, power factor, voltage, frequency, input voltage, input frequency, battery voltage, efficiency, and power usage. Figure 5 shows the rear view of the RT8kVA or RT11kVA 6U Rack or Tower UPS (200-240VAC). Figure 6 shows the rear view of the RT8kVA or RT11kVA 6U 3:1 Phase Rack or Tower UPS (380-415VAC). 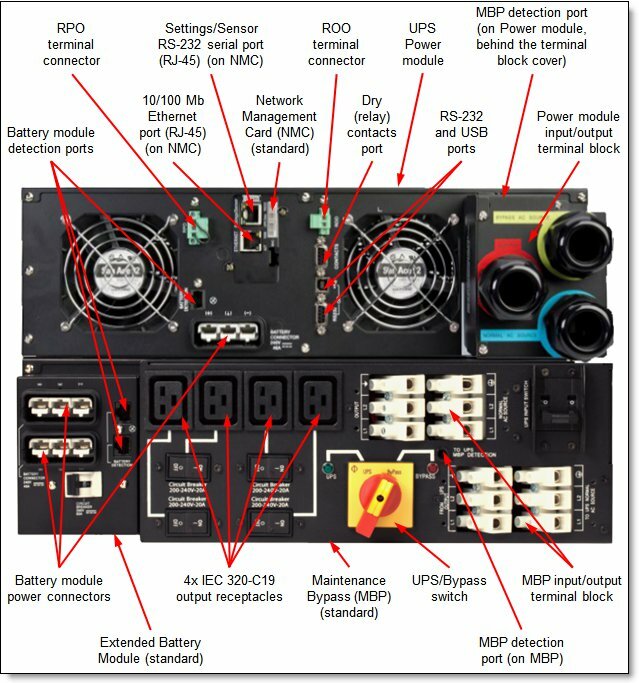 Figure 7 shows the rear view of the 8kVA/11kVA 3U Rack or Tower Extended Battery Module (55949BX). 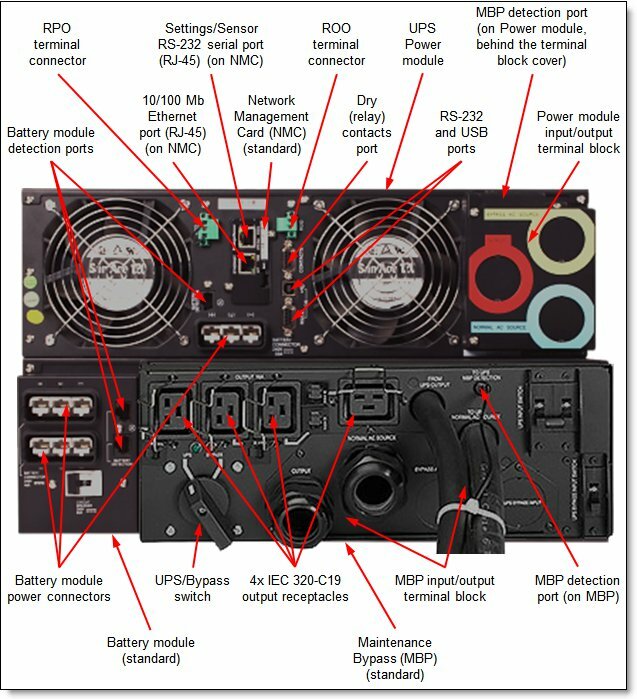 The RT8kVA and 11kVA 6U Rack or Tower UPS models and the Extended Battery Module (EBM) have a 3-year limited warranty. Optional features have a 1-year warranty. The RT8kVA and RT11kVA 6U Rack or Tower UPS offerings are compatible with all System x and ThinkServer servers and other devices that require AC power. The RT8kVA and RT11kVA 6U Rack or Tower UPS units can be installed in the compatible rack cabinets that are listed in Table 4.